We are exporter of Remote Tester. Our product range also comprises of Lightning Arrester, Protection Device and Earthing Electrode. We have marked a distinct position in the market by providing high quality range of Remote Tester. This remote tester is designed by utilizing best quality material consists of global standards. Our offered remote tester is generally used in a number of industrial applications. In order to give final approval from end, we test this remote tester on various parameters for ensuring its flawless finish. 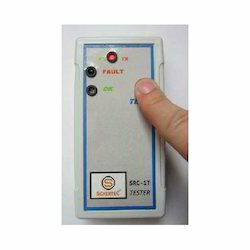 Looking for “Solar Tester SRC- 1T”?